I have been spinning a cane since 2006. At first it was a way to explore aikido, a martial art often been accused of looking like dancing. Then I joined the Albany Spin Jam, where it became something else. Now it is a full fledged performance style, ready to be shown. As a performer, I spin cane, single cane or double cane, fire or no. If you have never seen me in action, it is quite possibly like nothing you have ever seen before. I hope to offer my own performances in the near future. However, at this time, all my performances are as a member of other fire spinning troupes from the Albany, NY area. 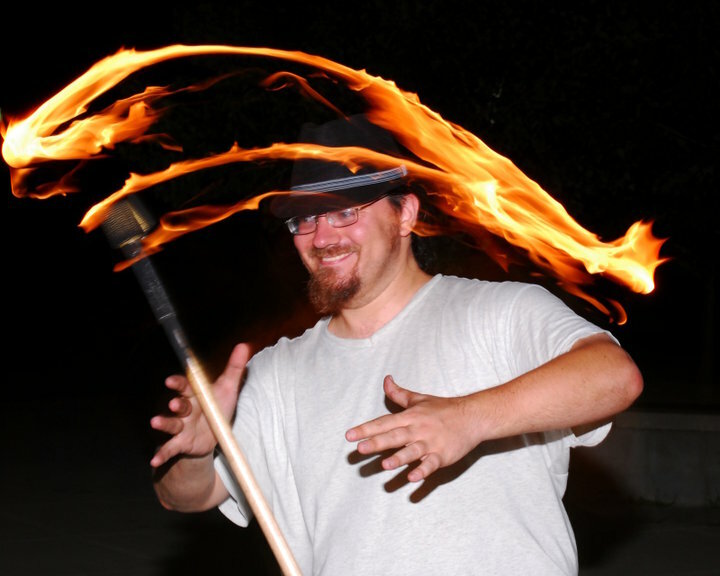 Meanwhile, if you are at all interested in fire spinning, stop by the Corning Preserve Amphitheatre in Albany, NY on a warm Tuesday night and say hi to the spinners at the Albany Spin Jam. It’s not an event, and there are no fees. It’s a gathering of like minded individuals who wish to hang out, spin, and have a good time.